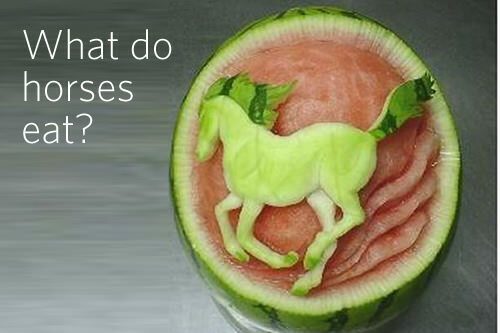 Blog What kind of food do horses eat? A horse’s favorite breakfast, lunch, and dinner is nothing other than good ol’ grass! In addition to grazing on pasture, horses also often eat things like hay, concentrates, and treats! Let’s a take a closer look at each. Hay is sold in bales with each bale being made up of between 10 to 14 flakes (slices of the bale). Hay is also sold in cube or pellet form. There are several different types of hay including alfalfa, timothy, oat, bermuda, and orchard. Grains like oats, barley and corn are also known as concentrates. They are often pre-packaged and come in combinations designed for very specific needs. For example, there are feeds for older horses, horses that compete, and younger horses. Treats like apples and carrots are relished by horses and they’re good for a horse as well. It’s important to remember that a horse needs up to 12 gallons of fresh, clean water a day. That’s a lot more than 8 glasses! Generally speaking, an active, healthy horse needs 2 to 2.5 pounds of feed for every 100 pounds of his weight. An average 1,000 lb horse needs 20 to 25 lbs of feed a day. A typical diet for a horse being ridden for one hour for five days a week would be 2 to 5 pounds of concentrates and 15 to 20 pounds of hay per day. Because horses have a small stomach relative to their size, they eat little and often. A horse kept in a stable needs food spread out, preferably in two to three feedings a day. Horses should never go more than eight hours without food.